May be a naively simple variation on that other George—Orwell—but it remains a dazzling triumph of creativity and style over financial limitations. 88 min. Warner Brothers. Director: George Lucas. Cast: Robert Duvall, Donald Pleasence. At an early theatrical screening of George Lucas's THX 1138: The George Lucas Director's Cut, I watched over thirty people walk out in a confused and irritated tizzy, thinking, this is from the Star Wars guy? Well, yeah. Lucas's first feature film, from 1971, may be a naively simple variation on that other George—Orwell—but it remains a dazzling triumph of creativity and style over financial limitations. Shot around the Bay Area at locations like the then-under-construction BART system, the Marin County Civic Center, and the Lawrence Livermore labs, THX 1138 applies a distinctive look to a fretful futuristic story devised by Lucas and scripted by Lucas and Walter Murch. Murch's sound montages are as effective here as in The Conversation. In tandem with the music by Lalo Schifrin, the photography by David Meyers and Albert Kihn, and Lucas's own editing, THX 1138 has the artful integrity and patiently confident style emblematic of the best '70s filmmaking (Lucas's buddy Francis Ford Coppola has executive-producer credit; Coppola encouraged Lucas to pursue the project). Robert Duvall in the title role and Donald Pleasence as his wild-eyed foil SEN 5241 don't hurt. 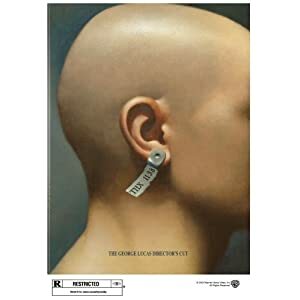 THX 1138 is a worker in an exploitative system which forbids "illegal sexual activity" and "criminal drug evasion" (sedation increases production). Lucas evinced his world's lobotomized mindset by having every performer's head shaved; sedation contrasts to madness and lonely sanity. When THX and his life-mate LUH run afoul of the system, which is micromanaged from control rooms, the chase is on as a handful of rebels go after the light at the end of the tunnel. When the futuristic "color" gives over to the escape phase of the plot, the film actually loses steam. Ominous but often amusing, THX 1138 fills to bursting with deadpan satire. Musak underscores warnings against "Criminal drug evasion" and "illegal sexual activity." Automated confessional booths spew untimely, indefinite advice ("Could you be more...specific?"). Live humans are ear-tagged like animals or corpses. Police beatings share the airwaves with dimwitted sitcoms. Trials might as well be held in the Tower of Babel, though the phrase "Are you now or have you ever been...?" wafts sinisterly above it all. Education travels through IV tubes. A hologram who becomes human remarks, "It's a strange life." Lucas's Things to Come is starker than any of Steve (Spielberg)'s science-fiction outings. Radicals are conditioned in a white void; officers prod with painsticks (which make proto-lightsaber sounds) while tech-support guys kibbitz pitilessly. Lucas's director's cut—following the paradigm of the Star Wars Special Editions—adds cosmetic special effects to spruce up transitions and intensify the action (the mind-lock sequence; the escape into a rush-hour crowd). At first, the low-key changes don't detract much from the elegant look; gradually, the changes become more intrusive, like the feral beasts which attack THX near the film's end. Lucas's infectious science-fiction enthusiasm can also be undisciplined (a pre-credit snippet from the Buck Rogers serials breaks the mood before Lucas can establish it), but the basic concepts of exploitation of the masses and affectless political talk versus personal action still have allegorical kick. THX 1138 is deliberate and, in the last act, slow, but this futuristic fable has enough incisive humor and potent drama to recommend it as more than a curiosity. The main complaint film purists will have with THX 1138: The George Lucas Director's Cut on Blu-ray is that Lucas has again withheld the original cut of the film, which could seemingly be included with minimal effort via seamless branching. This 2004 cut, as his fans know by now, incorporates designs and effects made over thirty years after the original release. Given that caveat, this is the best available home video presentation of the film (what, you'd prefer the untampered-with VHS at this point? ), in a hi-def transfer that offers an impressive upgrade over DVD. Film grain is mostly present (save for a few conspicuous instances of DNR), color and skin tones are vibrant and life-like, and detail and texture are quite fine, making the most of the original photography. Likewise, the DTS-HD Master Audio mix maximizes the incredible work of sound designer Walter Murch, with decent directionality and without any garish overhaul. The audio commentary by co-writer/director George Lucas and co-writer/sound designer Walter Murch is a satisfyingly measured recounting of the history of the film, including production approaches. Theatre of Noise - Sound Effects-Only Track is an intriguing opportunity to isolate Murch's work. The featurettes "Master Sessions with Walter Murch" (29:29 with "Play All" option, SD) comprise "Radio Chatter Voices" (2:13), "The All-Pervasive Voice" (1:15), "Music as Sound Effects" (2:07), "Creating Echo Effects" (3:29), "Cubistic Sound in the Trial" (2:20), "Torture Scene" (2:39), "Music Box in the MRI Scene" (1:54), "Room Tone in the Limbo Prison" (2:43), "Thunder in Limbo" (1:43), "Dynamic Range in the Rushing Hallway" (3:28), "I Think I Ran Over a Wookiee" (2:09), "Jet Car Sound Effects" (1:27), and "Motorcycle Sound Effects" (1:56). The documentary A Legacy of Filmmakers: The Early Years of American Zoetrope (63:38, SD) does an excellent job of summing up the brilliance and folly of the San Francisco-based film production company headed by Francis Ford Coppola and George Lucas. Narrated by Richard Dreyfuss, the doc includes interviews with Lucas, Coppola, and filmmakers Walter Murch, John Milius, Carroll Ballard, Caleb Deschanel, Robert Dalva, Matthew Robbins, Ron Colby, John Korty, Willard Huyck, Steven Spielberg, and Martin Scorsese. Also on hand: former WB production head John Calley, Zoetrope employees Tony Dingman and Mona Skager, Eleanor Coppola, and Robert Duvall. "Artifact from the Future: The Making of THX 1138" (31:10, SD) is nearly as interesting and features many of the same participants (as well as footage from the Lucas archives), including Lucas, Murch, Duvall, Coppola, Robbins, Korty, Deschanel, Huyck, Ballard, Colby, and Dalva. New to this doc are director Frank Darabont, Maggie McOmie, Don Pedro Colley, lighting gaffer William Mayley, director of photography David Myers, property master Ted Moehnke, and key grip Ken Phelps. We also get the student film that started it all: George Lucas' 1968 "Electronic Labyrinth THX 1138 4EB" (15:03, SD). Robbins' original two-page treatment is here as a sort of easter egg. The vintage production featurette "Bald" (8:06, SD) focuses on the cast's haircuts. Appearing are Lucas, Coppola, Duvall, McOmie, Johnny Weissmuller, Jr, and Marshall Erwin Efron. Theatrical Trailers include "1971 Original Theatrical Trailer" (2:59, SD) and the 2004 Re-Release Trailers "The Future" (2:19, SD), "What's Wrong?" (2:07, SD), "Characters" (1:58, SD), "Pure Cinema" (2:19, SD), and "Be Happy" (2:45, SD). All site content © 2000-2019 Peter Canavese. Page generated at 04/21/2019 05:41:41AM.